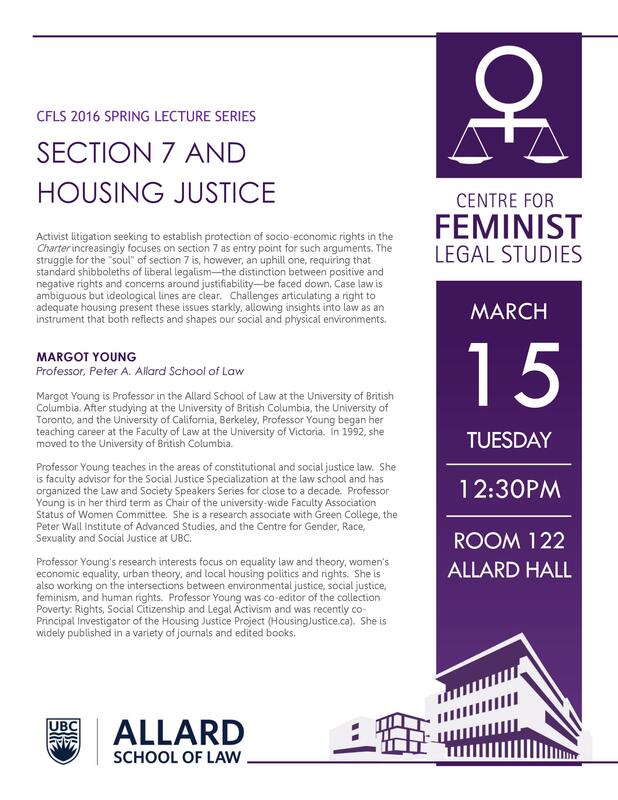 Allard School of Law’s own Professor Margot Young will be speaking in the final lecture of the Centre’s Spring lecture series on section 7 of the Charter and housing justice. 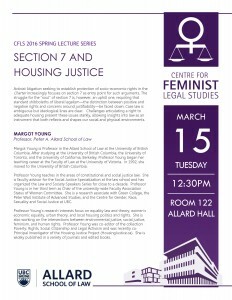 She will discuss how the struggle for the “soul” of section 7 is an uphill one, requiring that standard shibboleths of liberal legalism—the distinction between positive and negative rights and concerns around justifiability—be faced down. 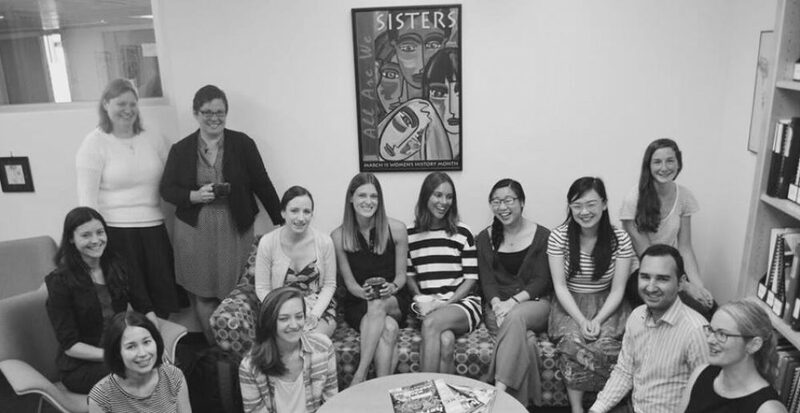 Coming up next Tuesday, Patricia Cochran will be joining us from the University of Victoria to talk about “Not Judging: Restraint and Refusal in the Exercise of Legal Judgment.” She will be exploring this theme in the context of the 2015 Supreme Court of Canada decision in Kahkewistahaw First Nation v Taypotat. 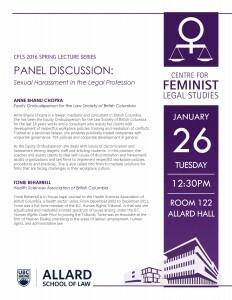 We have an exciting lecture to look forward to when we come back from reading week! 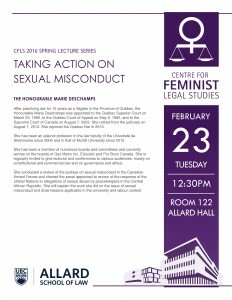 Former Supreme Court of Canada Justice, the Honourable Marie Deschamps, will be speaking about the review she conducted of policies on sexual misconduct in the Canadian Armed Forces. 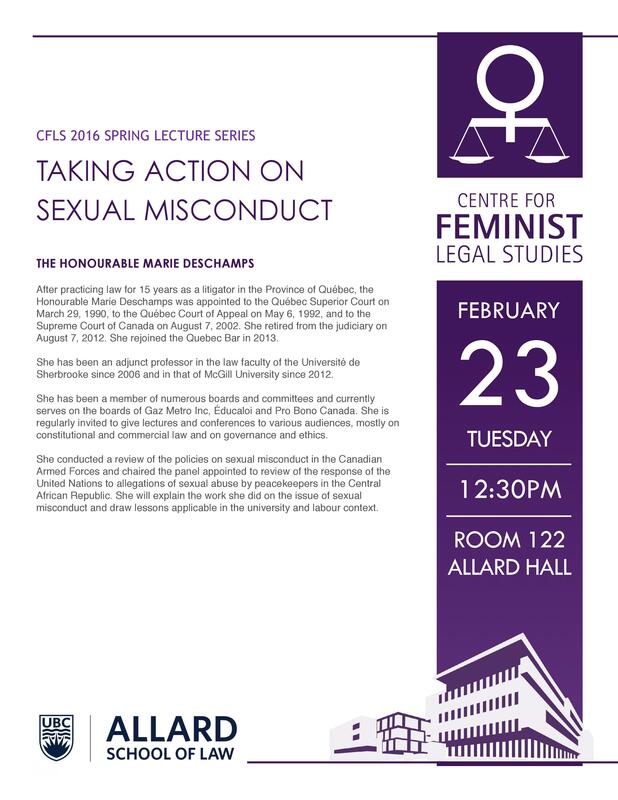 Her lecture is titled “Taking Action on Sexual Misconduct” and will take place in room 122 at 12:30pm next Tuesday, February 23rd. 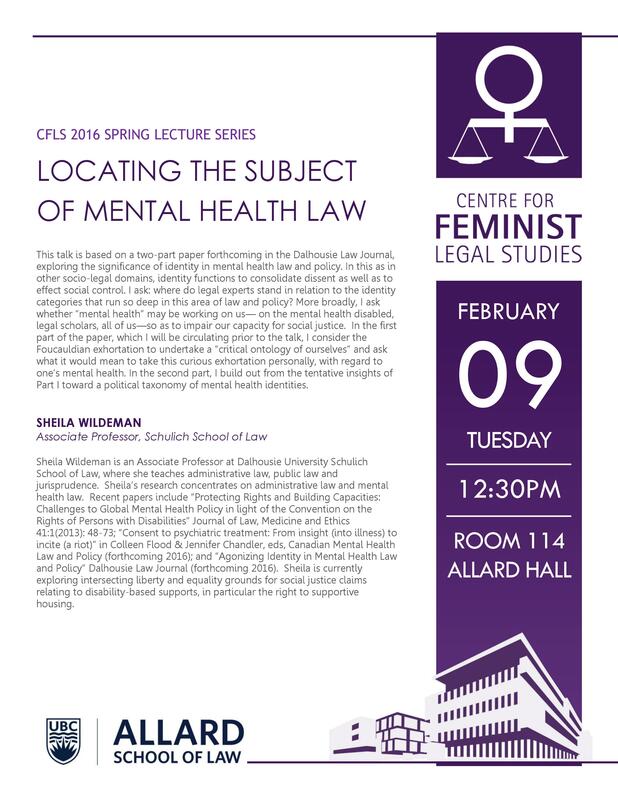 Sheila Wildeman (Associate Professor, Schulich School of Law) will speak next Tuesday on “Locating the Subject of Mental Health Law”, exploring the significance of identity in mental health law and policy. 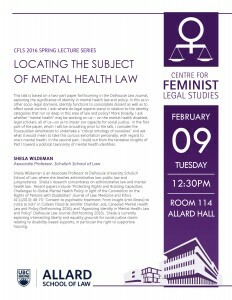 The CFLS Lecture Series is back at Allard Hall next week! Anne Bhanu Chopra (Equity Ombudsperson for the Law Society of British Columbia) and Tonie Beharrell (Health Sciences Association of British Columbia) will speak on Tuesday, January 26th at 12:30pm in Room 122, addressing sexual harassment in the legal profession.